From Hanging Rock to Bitter Wash Road, the Australian bush has long provided writers with a backdrop of terror. A new wave of crime fiction is taking it up a notch. 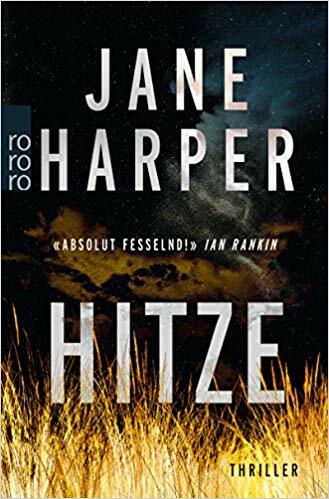 Jane Harper’s The Dry („Hitze“ the name of the German edition at Rowohlt paperbooks) opens with a quintessentially Australian scene: blowflies swarming around wet wounds in a hot, rural, remote town. The flies are not feeding on animal carcasses, however. They are feasting on the bloodied remains of a mother and young son, butchered in their own homes. It is, apparently, an open-shut case of murder-suicide: Luke Hadler, driven mad by years of punishing drought, turned a gun on his loved ones first, then on himself. Kiewarra is suffering the worst conditions of a century, a tiny outpost shimmering under “day after day of burning blue sky”. Farmers tell themselves “it’ll break”, repeating the words “out loud to each other like a mantra, and under their breath … like a prayer”. No one is surprised when one of their own finally snaps. All, however, is not what it seems. When policeman and former Kiewarra resident Aaron Falk returns home for his childhood friend’s funeral he starts to ask questions. Did Luke really kill his wife and son in cold blood? Or is foul play at hand? 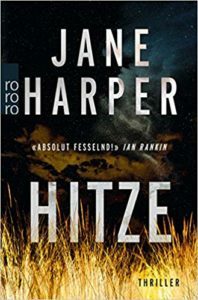 Harper’s first novel portrays the outback at its most cruel: a force that gives and takes life, as unforgiving and fierce as the bleak Nordic snowscapes that have become synonymous with great crime and horror writing. In the wake of The Dry’s success (it has already been sold to more than 20 publishers worldwide and Reese Witherspoon’s production company has optioned the film rights) – it is worth asking the question: how has Australian crime writing carved itself a niche using the landscape as a canvas for fear? There is a parallel to be drawn here with Scandinavian noir. Both regions, for example, are among the safest in the world: indeed, Australian murder rates are at record lows. Yet their relative peace seems to make homicide and butchery – when committed to the page – all the more alarming. A number of Australian crime and horror writers have embraced the singularity of the local landscape over the last decade. Garry Disher’s Bitter Wash Road (2013) is set in the bare, brittle “hardscrabble country” of South Australia’s wheatbelt. Adrian Hyland’s two crime novels Diamond Dove (2006) and Gunshot Road (2010) take place in rural towns where mangy dogs swarm. As seen by Hyland’s Aboriginal protagonist – amateur detective Emily Tempest – the desert in central Australia is alive and animate; to the mining companies, however, it is a resource to be exploited. Charlotte Wood’s feminist horror novel The Natural Way of Things, published last year and also optioned for a film, sees 10 women drugged, abducted and held against their will in the outback. The remoteness of the bush drums home the savagery of their imprisonment, and their very survival depends on their embracement of that same harsh environment. In The Dry, Falk wanders down gloomy country roads. Nocturnal insects rattle “like white noise”. Birds shriek. The community is mired in poverty. And where the river should be carving its way through the fields, there is only “an eerie nothingness” a “dusty scar in the land”. Disher, Harper, Hyland and Wood all tap into a long tradition: one in which landscape is both a trigger for psychological change, a marker for pathetic fallacy, and a mirror that draws on deep-seated fears and cultural clashes about what it means to be Australian. Early fiction in Australia saw the bush as land to be conquered. Late 19th century bush ballads – used as a tool to encourage exploration, exploitation and European settlement – lionised settlers able to tame the wild country. Like the cowboys of America’s wild west, poems such as Banjo Paterson’s The Man from Snowy River romanticised the brave and the brawny. But if Australia views itself as a bush nation, today it is squarely suburban: nearly 90% of the population live in urban areas hugging the coast. That goes some way to explaining why portrayals of the bush have shifted from a terrain to be vanquished and conquered, to an entity that is “other”, far away and frightening. Early writers such as Henry Lawson recognised Australia as ripe for suspense: with the “everlasting, maddening sameness of the stunted trees”, the suffocating loneliness and the danger of wild beasts all portrayed in his short story The Drover’s Wife, there was no need to resort to the supernatural. True-life tales have bolstered rural Australia’s reputation as a menacing place, including the disappearance of Peter Falconio in 2001; the murders pinned on former abattoir worker Andy Albury on the “highway of death”; and the fates of the Page family of five who perished from thirst in 1963 on the Birdsville Track, their corpses discovered days later near Deadmans Sandhill. Literature and movies in the latter half of the 20th century revelled in the bush as a setting for horror, playing on gender roles for maximum impact. The 1970s saw the creation of two masterpieces of cinema: Wake in Fright, directed by Ted Kotcheff and based on the 1961 novel of the same name by Kenneth Cook; and Peter Weir’s Picnic at Hanging Rock, modelled on the 1967 book by Joan Lindsay. The former played on the isolation, pent-up violence and rampant masculinity of white outback Australia. In the latter, by contrast, schoolgirls vanish on an outing to the bush. It is noted that Hanging Rock has stood there for “a million years”, an ancient part of the landscape that the British could never dominate, no matter how hard they try. The girls’ disappearance shatters a carefully cultivated Victorian veneer, revealing repressed sexuality and simmering madness. The landscape, quite literally, consumes them. Bushfires, too, are fodder to show both a combustible society – with its raw tensions between Indigenous people and settlers, between “respectable” femaleness and the virile, ready thump of rugged manliness – and an explosive topography. The Dry uses fire – which “surged and jumped and gorged itself … like an animal” – to nail-biting effect, a weapon far more deadly and devastating than any knife or gun.